CITY OF WESTLAKE, FL - (March 25, 2019) - Residents of Westlake and their neighbors will soon have closer and easier access to healthcare. On Monday, March 25th, Westlake developer, Minto Communities, joined representatives from Wellington Regional Medical Center, Universal Health Services (UHS) and the City of Westlake to celebrate the end of construction of the new ER at Westlake— a 10,379-square-foot free-standing emergency medical facility. Those who attended the VIP ribbon cutting and reception also had an opportunity to take a tour of the emergency room which is expected to open to the public on April 9th. Located at 16750 Persimmon Boulevard, the new ER is owned and operated by Wellington Regional. It will provide emergency medical care 24-hours a day, seven days a week with eight exam rooms, three rapid medical exam bays, one triage room, on-site lab services and on-site radiological services. Doctors and staff will treat everything from cuts and bruises to heart attacks and strokes, with the ability to airlift patients to the main hospital if needed. The hospital’s parent company United Health Services (UHS) acquired the 5.66-acre site from Minto, and construction began last spring. The ER marks the first commercial development to be delivered within Minto’s 3,800-acre master-planned community and the city’s first healthcare facility. Minto is approved to develop more than 2 million square feet of commercial space in Westlake in addition to 4,500 homes. Other non-residential projects in the works include Florida Power and Light’s new solar power farm and a Palm Beach County fire station and district headquarters, which broke ground just weeks ago. Plans are also in the works for the future Westlake Town Center, which will feature various retailers, restaurants and entertainment options. 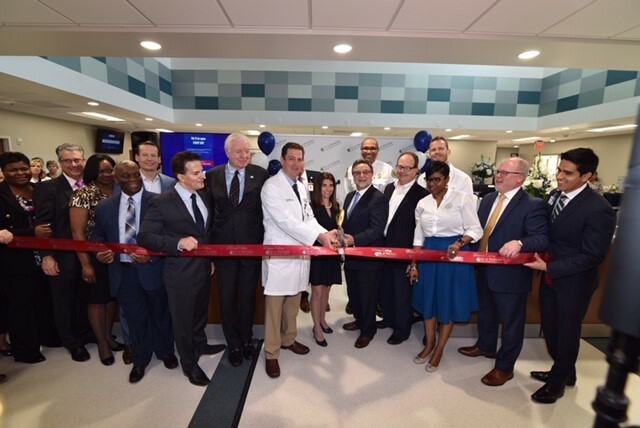 Representatives from Wellington Regional Medical Center, United Health Services, Minto Communities and the City of Westlake cut a ribbon to dedicate the new ER at Westlake. Minto Communities USA, based in Florida since 1978, has represented integrity, financial strength and enduring value for over 40 years. Minto builds exceptional new homes and communities to meet every lifestyle, with more than 25,000 new homes built in 48 communities. Minto is dedicated to continuous improvement in design, quality and customer experience. These are just some of the elements that set Minto apart as an exceptional homebuilder and community developer and have earned the company national recognition that includes consistently high rankings from Eliant Customer Service Surveys. Minto has been recognized with multiple national awards from the National Association of Home Builders (NAHB) for community and home design, including Best Mixed-Use Community and Best Clubhouse for The Isles of Collier Preserve in Naples, Florida; and Best Clubhouse for the Harbour Isle Beach Club in Sarasota-Bradenton, Florida. Minto won several Southeast Building Conference 2018 Aurora Awards, including the Grand Award for Best Multi-Family Residential Community for One Particular Harbour Margaritaville in Sarasota-Bradenton, Florida; and the Silver Award for Best Single-Family Residential Community for Westlake in the City of Westlake, Florida. Minto is recognized throughout the homebuilding industry as an expert in developing active-adult communities. The NAHB named Minto as 2019’s 55+ Builder of the Year and Latitude Margaritaville Daytona Beach as Best 55+ Community of the Year. One of the nation’s largest and most respected hospital companies, Universal Health Services, Inc. (NYSE: UHS) has built an impressive record of achievement and performance. Growing steadily since its inception into an esteemed Fortune 500 corporation, UHS today has annual revenues of $10 billion. In 2018, UHS was recognized as one of the World’s Most Admired Companies by Fortune; in 2017, ranked #276 on the Fortune 500, and listed #275 in Forbes inaugural ranking of America’s Top 500 Public Companies. Our operating philosophy is as effective today as it was 40 years ago, enabling us to provide compassionate care to our patients and their loved ones: Build or acquire high quality hospitals in rapidly growing markets, invest in the people and equipment needed to allow each facility to thrive, and become the leading healthcare provider in each community we serve. Headquartered in King of Prussia, PA, UHS has more than 83,000 employees and through its subsidiaries operates more than 326 inpatient acute care hospitals and behavioral health facilities, and 32 outpatient and other facilities in the United States, Puerto Rico, and the United Kingdom. For more, please visit www.UHSinc.com. Wellington Regional Medical Center is a 233-bed acute care hospital accredited by The Joint Commission. Celebrating more than 30 years of treating residents in Wellington and the surrounding community, the hospital offers a wide range of services, including comprehensive stroke care, comprehensive lung program, minimally invasive services, cardiac services, a birthing center and level III NICU, comprehensive women’s center, hepatobiliary surgical procedures, intraoperative radiation therapy, interventional procedures and a wellness and weight loss center. To learn more about the hospital, please visit www.wellingtonregional.com.